Yesterday, I got an email from the NSA stating that they were indeed canceling the printed editions of SCRABBLE News, but not doing away with it altogether. Their website states the same thing. The National SCRABBLE Association (NSA) has decided to take the SCRABBLE News to a new and exciting level. With rising postage costs and the 24/7 convenience of the Internet the NSA will offer SCRABBLE News online only at www.scrabbleassociation.com. Starting February 2011 we will also launch archival SCRABBLE News as downloadable pdf files, and we will continue to have fun and challenging puzzles created by three-time National SCRABBLE Champion Joe Edley, interviews conducted by NSA Executive Director John D. Williams Jr and SCRABBLE-related news at no cost to you, the reader! 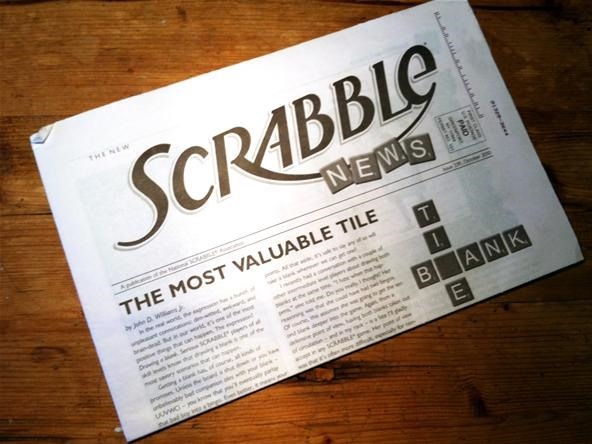 There will be a final printed SCRABBLE News issue 241 which will be mailed in February 2011 to current members. Have news you would like to share with the SCRABBLE world? E-mail Marketing and Media Manager, Katie Schulz ks@scrabble-assoc.com, and we will try to add it to our new online column. After 30+ years of publishing the printed SCRABBLE News, we understand that change is often hard. But we think this is a good move for everyone involved. Should you have remaining issues in your newsletter subscription that you would like to be reimbursed for ($2.50 an issue) please send a postage paid envelope with your request and mailing information to NSA Membership Manager, Theresa Bubb, PO Box 700, Greenport, NY 11944. All refund requests must be received before June 1, 2011. If you haven't already, please make sure you are signed up on our FREE roster of Clubs at www.scrabbleassociation.com. Each month members are offered special deals or introduction to new products. Whether you're a Casual Club player or an expert who memorizes the dictionary, we welcome you! I suppose this is actually a move for the better. It's a lot easier to look at a computer screen for instant access to the newsletter than to stare at your mailbox all day long, waiting for the special something that shows up every great once in a while. One thing Williams didn't outline was whether or not the online SCRABBLE News would be free to the public or for a small cost to NSA subscribers. Before, it cost 20 dollars for an annual subscription. Hopefully, it's free to all now, and with it being downloadable PDFs, it's hard to think it won't be.